We interrupt our Halloween posting extravaganza to bring you a scene from Tokyo Disney Sea that... can kind of be interpreted as spooky. It's from Raging Spirits, a roller coaster with a name that calls to mind poltergeists, and it's one of the thrill rides scattered across the park. 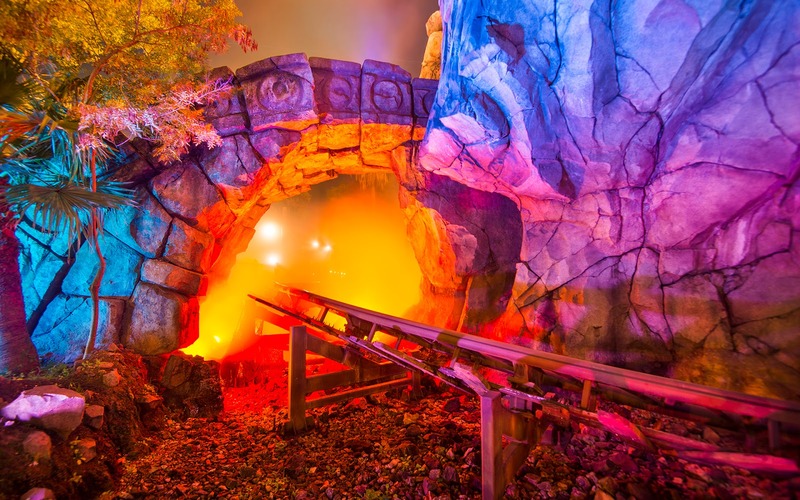 This one plays a tandem role with Indiana Jones and the Temple of the Crystal Skull, evoking the ghosts of the ancient jungle temple complex in this region of the park. It's rugged and decayed by day, but by night, it gains an almost supernatural sense, especially with the fog and dramatic lighting. Pretty spectacularly eerie, right? A mysterious from Raging Spirits.